"The entrance is blocked with barbed wire." Unidentified people have blocked the office of NewsOne TV owned by MP Yevhen Murayev, formerly of Viktor Yanukovych's Party of Regions, according to Interfax-Ukraine. "A lorry with bags whose contents are unknown drove close to the channel's office. People who call themselves activists are declining to comment and are not saying why the entrance and the exit have been blocked. 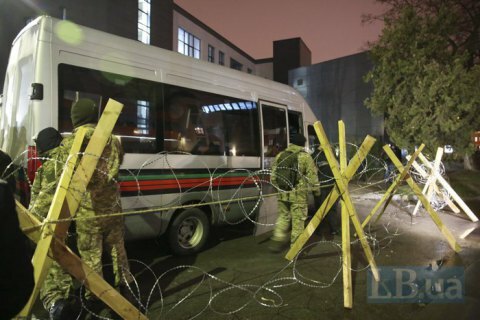 The entrance is blocked with barbed wire," the TV channel said. NewsOne said "it is the only channel broadcasting Mikheil Saakashvili's 'impeachment march' ", which may have prompted the protest. The channel said on its website that the activists demand that it change its editorial policy and its owner apologise for calling the Revolution of Dignity as a coup d'etat.